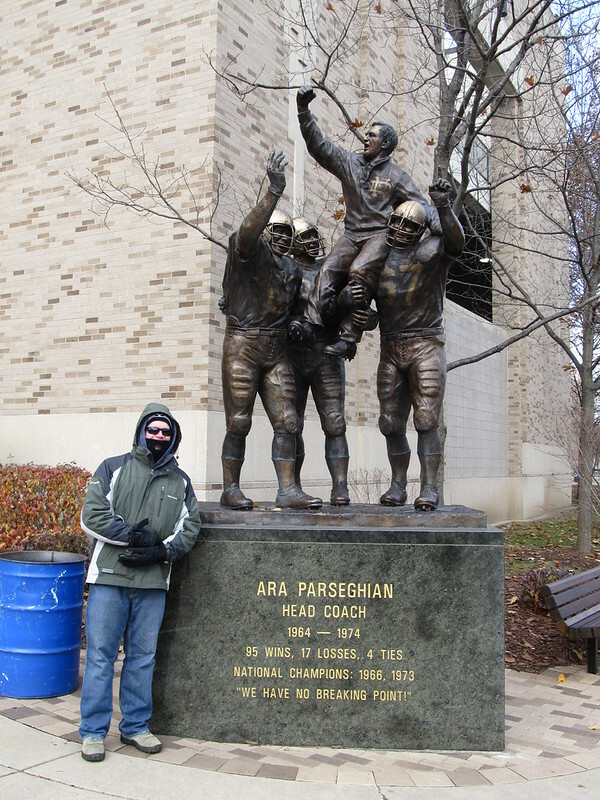 Ara Raoul Parseghian (born May 21, 1923) is a former American football player and coach of Armenian and French descent who guided the University of Notre Dame to national championships in 1966 and 1973. He is noted for bringing Notre Dame’s football program from years of futility back into a national contender in 1964 and is widely regarded alongside Knute Rockne, Frank Leahy and Lou Holtz as one of the best coaches in Notre Dame history. Parseghian grew up in Akron, Ohio and played football starting in his junior year of high school. He enrolled at the University of Akron, but soon quit to join the U.S. Navy for two years during World War II. After the war, he finished his college career at Miami University in Ohio, and went on to play halfback for the Cleveland Browns of the All-America Football Conference in 1948 and 1949. Cleveland won the league championship both of those years. His playing career cut short by a hip injury, Parseghian left the Browns and took a job as an assistant coach at Miami. When head coach Woody Hayes left in 1951 to coach at Ohio State University, Parseghian took over his job. He stayed in that position until 1956, when he was hired as head coach at Northwestern University in Illinois. In eight seasons there, he amassed a win-loss-tie record of 36–35–1 and helped turn a perennial loser into a consistent contender in the national polls. Parseghian’s success attracted the interest of the University of Notre Dame, which had not posted a winning record in five straight seasons. He joined as coach in 1964 and quickly turned the program around, coming close to capturing a national championship in his first year. He proceeded to win two national titles in 11 seasons as coach of the Notre Dame Fighting Irish, a period often referred to as "the Era of Ara". He never had a losing season at Notre Dame and posted an overall record of 95–17–4, giving him the third-most wins of any coach in school history after Rockne and Holtz. Parseghian quit coaching in 1974 and began a broadcasting career calling college football games for ABC and CBS. He also dedicated himself to medical causes later in life after his daughter was diagnosed with multiple sclerosis and three of his grandchildren died of a rare genetic disease. Parseghian was inducted into the College Football Hall of Fame as a coach in 1980. His career coaching record is 170–58–6. Image published by Ken Lund on 2013-11-25 08:52:16 and used under Creative Commons license.